Thank you for visiting Coweshouse.net - if you're looking for a holiday rental home in the Isle Wight, we're sure you'll love 17 Market Hill, with its stunning views of Cowes Harbour and the Solent. With two double and three single beds, the house can comfortably accommodate a family of four or a group of up to six people. You'll find a selection of photos, full availability details and prices, and an interactive map in the contact us section - simply use the menu above to navigate through the site. If you'd like further information, do send us an email and we'll get straight back to you. 17 Market Hill is ideal accommodation for a family of 4, but can accommodate up to a maximum of 6 people. 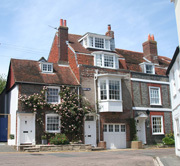 The house is around 250 years old and situated in the part of Cowes, often referred to as the 'Old Town'. We have been told that it was variously a sweet shop and at one time a cobblers with the integral garage in the position where the shop front used to be. The house is tastefully furnished with two double bedrooms, one twin-bedded room, a study (which can be a 4th bedroom), and a marvellous bathroom with a Victorian style bath in the middle of the room complete with claw feet and period style mixer tap. At first floor level, there is a lovely galleried landing with the top landing Velux window giving a naturally sunny aspect to the house. The second floor master bedroom has an antique style cast iron/brass bedstead, described as looking like a 'well-loved family heirloom'. All bedrooms, study, bathroom, cloakroom, landings, stairs and hallway have fitted carpets. The kitchen, sitting & dining rooms have original flagstones and/or polished wood floors. All front windows have views of the sea; at the top they are spectacular. Accessed from either the dining room or kitchen stable door, there is a small patio which is a suntrap from early morning to evening and excellent for alfresco breakfasts and barbecues. The house is perfectly situated for sailing and for the Red Funnel (foot passenger) high-speed ferry to Southampton (22 minutes), being just 5 minutes walk away from the Marina and the various Cowes Yacht Clubs. If coming by car to the island, then the WightLink car ferry from Portsmouth to Fishbourne is probably best and road directions to the house will be supplied on booking.